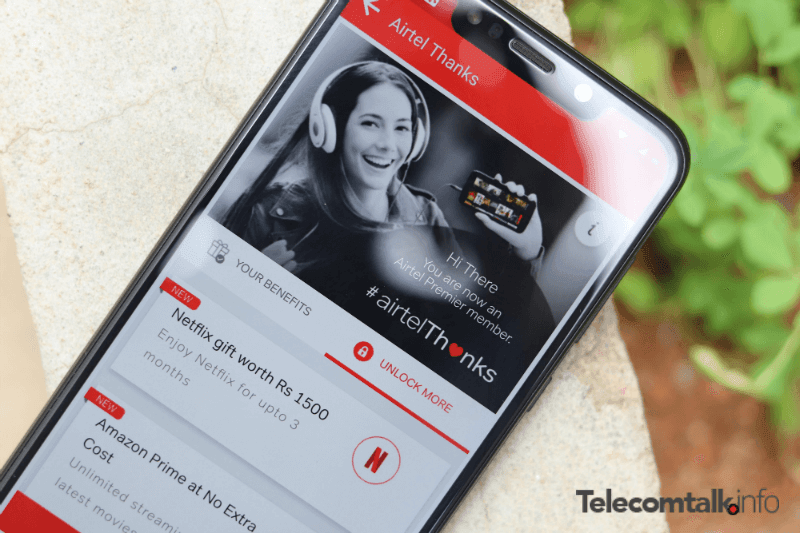 Bharti Airtel has made a revision to the Rs 399 entry-level postpaid plan and it now ships with Amazon Prime subscription. Furthermore, the telco is now offering 40GB of data every month without any expiry period. Earlier, Airtel offered 20GB of additional data on top of the standard 20GB data benefit for a period of 12 months or one year. But that has been removed now and the plan ships with 40GB of data along with data carry forward feature. Furthermore, the plans ships with unlimited voice calling and 100 SMS per day benefit. In contrast, Vodafone is also providing Amazon Prime membership for one year with its RED Rs 399 Basic postpaid plan. Airtel has been offering the Rs 399 postpaid plan for a long time, but very recently, it revised the plan to take on Vodafone’s RED 399 postpaid plan. After the recent revision, the Rs 399 myPlan Infinity Postpaid plan of Airtel is providing 40GB of data, unlimited voice calls to any network within India and 100 SMS per day for the entire rental period. Additionally, Airtel users can enjoy free access to Airtel TV and Wynk Music, along with free Rs 51 Amazon Pay Gift Card. Starting today, Airtel users on the Rs 399 postpaid plan can also be able to redeem free Amazon Prime membership worth Rs 999 for one year. Notably, Airtel is also providing Rs 50 discount every month for six months with this postpaid plan. This essentially means that you can get the plan at Rs 349 every month. How to Redeem Amazon Prime Membership? If you’re on the Airtel’s Rs 399 postpaid plan, you can follow the below steps to avail the free Amazon Prime membership. Fire up the Airtel TV app or My Airtel app. If you haven’t downloaded these apps yet, then download them first for free from the Google Play Store or Apple App Store. After downloading, if you want to redeem via Airtel TV app, you’ll see a banner on the home screen asking you to redeem the benefit which comes bundled with your postpaid plan. In the My Airtel app, Airtel has created a new menu called ‘Airtel Thanks‘ and all the benefits associated with your postpaid/prepaid plan will be visible under that menu itself. Right after opening the My Airtel application, you can see the Airtel Thanks banner, click on it and you’ll see the Amazon Prime membership option. Follow the on-screen steps to redeem one-year of Amazon Prime subscription for free. This move from Bharti Airtel could be to retain its postpaid base and also to add more users on board to increase the ARPU. Airtel’s move is largely due to the pressure from Vodafone and BSNL. Back in April this year, Vodafone revamped its entire RED range of postpaid plans to provide double data benefit and during the same revision, the UK-based telco started offering Amazon Prime subscription to its users even with the Rs 399 postpaid plan. Except for the Rs 299 plan, all the Vodafone RED postpaid plans ship with free Amazon Prime membership for one year. And very recently, state-run telco Bharat Sanchar Nigam Limited joined the list and is currently providing free Amazon Prime subscription of Rs 999 for one year with its postpaid plans priced at Rs 399 and above. And to no one’ surprise, Airtel has started providing free Amazon Prime subscription worth one year with its base postpaid plan. Launched back in December 2016, Amazon Prime membership is the company’s premium scheme which can be availed for Rs 999 for one year. Amazon Prime users usually get access to any major sales ahead of others, and free and faster shipping on many items. Users will also get free access to Amazon Prime Video and Amazon Music to watch and enjoy music. Operators should get rid of all these gimmicks. If a user wants Amazon Prime membership, they can pay for it themselves. They should instead drop the prices by saving the money paid to Amazon. after smart recharge i remove vodafone and using BSNL.. surprisingly BSNL 3g speed is much better.. speed result using VPN otherwise i get 7Mbps download..
VPN can increase speed also?? yes…but consume little extra data. Drastic change is there in speed or little bit after using vpn? How much data you have of daily? 2GB or 3GB? “inf vpn”.. google it… this app not available in playstore. surprisingly this app not access location, phone, sms… nothing…. Latency is very high – 396ms. Also with only 5mhz spectrum in 2100mhz band, theoretical max speed is 21.1 Mbps, that too with upgraded network gear and backhaul. This speed test seems to have some error. whose error of BSNL or netvelocity app ? Yeah, some apps show double the speed when using vpn. So it seems like Netvelocity captured the speed through the vpn as well as the internet speed. He should be getting 12 to 13Mbps down and around 3Mbps up. Download ADM app, and download a 1GB test file, take a screenshot while downloading using the vpn. You shouldn’t reach more than 1.4MB/s when downloading. 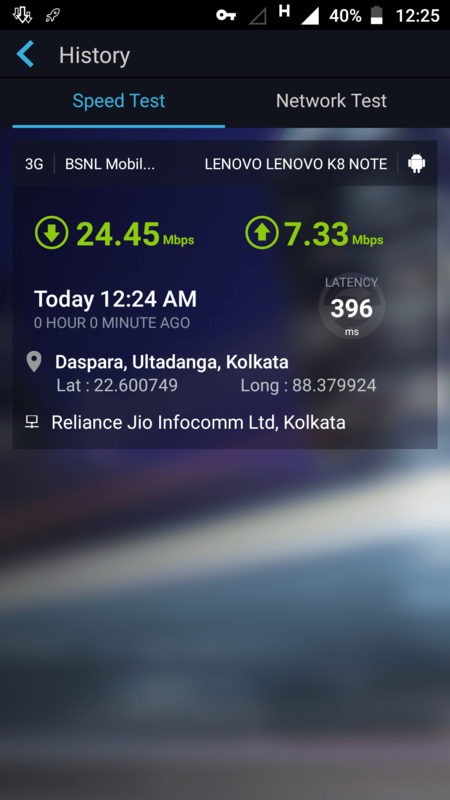 While using VPN the app shows double speeds. i have tested. Bsnl 3G speeds are good, enjoy.